We’d love your help. Let us know what’s wrong with this preview of November Foxtrot by Scarlett Jade. Zoe is left all alone in Colorado when Calvin returns to Afghanistan. And now, as the weeks pass, she has a secret...a secret that could crumble the precarious foundation of their relationship. As Christmas comes one shock after another leaves everything hanging in the balance... Life, death, and hope...Will they be able to ring in the New Year in happiness, or will the ho Zoe is left all alone in Colorado when Calvin returns to Afghanistan. And now, as the weeks pass, she has a secret...a secret that could crumble the precarious foundation of their relationship. As Christmas comes one shock after another leaves everything hanging in the balance... Life, death, and hope...Will they be able to ring in the New Year in happiness, or will the holidays be ruined? To ask other readers questions about November Foxtrot, please sign up. This is book two in the Rhythm of the Heart series. They do need to be read in order. After the wedding, Zoe and Calvin moved to Colorado, before he was shipped off to Afghanistan. Feeling alone and depressed, Zoe is having trouble coping with the deployment. After receiving some news from her doctor, she decides to return to Major, AL to spend time with the only family she now has, Calvin’s grandparents and his little sister. While there she has to deal with the advances of her ex-boyfriend, the bitterness of Layla, surprises, and complications. When Calvin is able to come home for Christmas, he is bombarded by the multitude issues she is facing. Is it too much for such a new marriage? I just want to hug Zoe and tell her everything will be okay. She has a friend. She is not alone, ever. Layla needs a spanking, but most 17 year olds do. Grandma and Pops are both so supportive, but I love Pop’s no-nonsense manner and advice. Calvin – sigh! – he is so strong and sure of himself without being an asshat (most of the time). Since this is loosely based on Scarlett’s life with Llerxt, I am even more in love with them as a couple and will be doubling up on the virtual hugs I send to them. This book is a personal journey in those first few months of marriage, interrupted by all that life can throw at a couple. It is a story of hope, trust, and friendships that make a difference. It is also a story of faithfulness and learning to depend upon each other. A personal note to Scarlett: Scar – I cried when I read about Zoe’s pregnancy and the birth of her daughter. I was thinking of your daughter’s birth and seeing it so lovingly portrayed in this book – knowing what I know. I need to say you are a brave, wonderful momma and I know Sophie is proud of you! Many, many hugs. I loved it! It was even more amazing than September Tango! At the end of September Tango Calvin and Zoe were married and living in Colorado. Calvin had to go off to Afghanistan, leaving Zoe in a brand new city (state even) so far from home and worrying about his safety as he went into a war zone. I don’t want to go into too much detail because I hate to give away anything that is in the book, so I will say there is a huge secret, one that in some instances could destroy a relationship. The question is can they survive this? I can tell you that the chemistry between ALL of the characters is amazing. There are side stories along the way and things that will take you by surprise. Calvin and Zoe are as amazing as always and Grams, oh Grams. I think everyone should have a Grams in there life. Grams had me laughing out loud at certain points in the book. She is hilarious, feisty, and nobody had better try to hurt someone she loves. She is such a fun beautiful character. This was an amazing follow up to September Tango and I cannot wait to see what comes next from Scarlett Jade (and for Zoe and Calvin). Thank you for my copy of November Foxtrot that I used to facilitate this review. At the end of the first book, Zoe and Calvin got married. This book starts off with Calvin going back to Afghanistan and he has been gone for a few weeks. Zoe is struggling with him being gone and left by herself in a new town. She's not dealing well with not hearing from him for long periods of time. After he has been gone for around six weeks she learns that she is pregnant, but she's not sure if it's Calvin's or her ex-boyfriend's. Struggling with being gone himself, Calvin is under a lot of At the end of the first book, Zoe and Calvin got married. This book starts off with Calvin going back to Afghanistan and he has been gone for a few weeks. Zoe is struggling with him being gone and left by herself in a new town. She's not dealing well with not hearing from him for long periods of time. After he has been gone for around six weeks she learns that she is pregnant, but she's not sure if it's Calvin's or her ex-boyfriend's. Struggling with being gone himself, Calvin is under a lot of stress and the danger that surrounds him is not helping. He hates that he is away from Zoe while she is pregnant. He is willing to stand by her no matter who the father is, he is sure in his heart that it's his. While they are dealing with the pregnancy, they are still having to deal with people from the past. Zoe encounters a hostile attitude from Calvin's sister, Layla. He comes home to celebrate Christmas and they try to have a happy one. While he is home Zoe is dealt another blow that has left her reeling. What will happen next and will they be able to have a happy ever after? 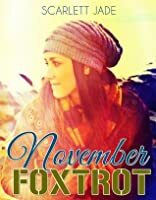 Foxtrot November by Scarlett Jade is about a woman named Zoe who is married to a man named Calvin who is in the Armed Forces. During his first deployment as a married couple, Zoe is struggling with being left on her own and not hearing from her husband for long periods of time. She also finds out she is pregnant. Unfortunately she is not sure if the baby is her husbands or an ex she slept with before she was with Calvin. Calvin is also struggling with his deployment, not just with the stress and d Foxtrot November by Scarlett Jade is about a woman named Zoe who is married to a man named Calvin who is in the Armed Forces. Calvin is also struggling with his deployment, not just with the stress and danger, but also being away from Zoe now that she is pregnant. He is willing to stand by her no matter who the father of the baby is. Not only do they have to worry about who the father is, but they also have to struggle with problems from people around them as well. November Foxtrot is the beautiful and heart wrenching continuation of Zoe and Calvin's love story. The book opens with Calvin having been deployed for the past 4 weeks and depression is hitting Zoe hard. 4 weeks and no word from Calvin. She can barely pull herself out of bed most days. Just when she thinks it can't get any worse, she's hit with the biggest whopper of all. With no relief in sight Zoe does the only thing she can think of. She heads back to Major and the love and comfort of the only family she has. Poor Calvin and Zoe seem to get hit with one problem after another...from Derek to Zoe's Dad, to Layla...and Tim, but true to form they face each obstacle head on and most importantly, together. Their relationship and love for each other is a beautiful thing to behold. And for those of you who adore Grams and Pops and all of their infinite love and wisdoms as much as I do, they are back and better than ever in this book! After reading September Tango I couldn't wait to find out what happens next in Zoe and Calvin's life. Last we heard Calvin has deployed to Afghanistan, leaving Zoe in a new town all alone, no family or friends around. Something happens, that could ruin her relationship she has built with Calvin and his family. Will their relationship withstand this new shock. Then Christmas comes around and it doesn't seem like Zoe can catch a break, she is left reeling. Everything that happens leaves you constantly on the edge of your seat. I really start to want to slap Layla upside the head in this one ....grrrr. Grams and pops ♥ these 2 sooooooooo much. All round a great book cant wait for people to read and review. I honestly can't wait to read the next addition in Zoe and Calvins story. Foxtrot November by Scarlett Jade is an absolutely enthralling sequel of Zoe and Calvin's breathtaking love story. November Foxtrot is a striking read that I would bind you from start till end and make you to crave for next in series. It is a very emotive story and has a cliffhanger which leaves us coveting for more. The characters have the potential to make you relate to them and texture their emotions. It’s a must read to all those book worms who are looking for a good book to read. 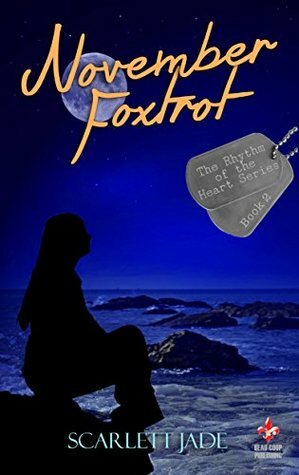 "November Foxtrot" is the second book in the Rhythm of the Heart Series. I love this writer! Her work gets better and better with every book she writes! This series is about a young mixed-race couple living in the South. Calvin, Zoe's husband is in the Army and they had recently married. Calvin settled Zoe in Colorado before he had to return to Afghanistan, she was trying to be the good wife fixing up their apartment but she was very lonely and was beginning to get sick. She decides to go back ho "November Foxtrot" is the second book in the Rhythm of the Heart Series. I love this writer! Her work gets better and better with every book she writes! This series is about a young mixed-race couple living in the South. Calvin, Zoe's husband is in the Army and they had recently married. Calvin settled Zoe in Colorado before he had to return to Afghanistan, she was trying to be the good wife fixing up their apartment but she was very lonely and was beginning to get sick. She decides to go back home for a couple of weeks to get some good home cooking and lots of hugs. Zoe is staying with Calvin's Grandparents who have to be the most loving people anywhere! They welcome her in and stuff her and make her feel so welcome and loved. It really made me miss my Grandparents! Complimentary copy received from author for an honest review. This review can also b Complimentary copy received from author for an honest review. Zoey and Calvin's story continues, this book picks up where September Tango left off. If you haven't read that one yet, I highly recommend reading that one first. Zoey is in Colorado while Calvin is in Afghanistan both of them are trying hard to keep it together while desperately missing each other. A trip to Major for the holidays will test both of them and rock their relationship to the core. Will they make it or will the secrets tear them apart? This is a great series! I'm on pins and needles Zoey and Calvin's story continues, this book picks up where September Tango left off. If you haven't read that one yet, I highly recommend reading that one first. Great 2nd part of the Zoe and Calvin's story. thoroughly enjoyed this, bringing us up to date, past Calvin's deployment and into Christmas. I don't think I've met anyone who has as much rubbish thrown at her as Zoe, but with Calvin by her side all she make it??? I guess the next installment will share a little more!!! nit so patiently waiting! Amazing sequel! I loved the entire book and couldn't believe a lot of the things that happened. It was one bombshell after another. This series is a must read. I can't wait to see what happens in February Waltz! I was so excited to find out that there was more to September Tango that I'm pretty sure I screamed! I was lucky enough to receive an ARC of this, finished it in one day and couldn't help but laugh when Zoe and Cal laughed or be sad when one of them were. I can't wait for the next book! OMG loved it. Wish I could read the next one in this series today but need to wait till I get paid next week. I really feel the hurt and emotions in the words this author puts to paper. Awesome!! A truly great love story. Only downfall is it has a cliffhanger, now we wait for the third one to come out. I was given this for an honest review. This is the sencond book in a 3 book series. This is such an enjoyable story.